Adam Silvera does it again with another heart warming yet equalling breaking novel. 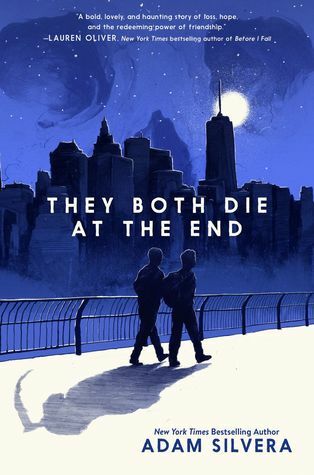 They Both Die at the End tells a tale of two boys who receive phone calls early in the money stipulating that they have 24 hours left to live. They embark on a journey which in turn starts with them finding each other on the "last friend app". The storyline was magnificent and entertaining. The characters were so real and easy to connect too. Both components led to a great and enjoyable read. The plot was interesting and I loved the premise. This book basically took place in a world like ours, except death is predicted and proclaimed about. This allowed for readers to get easily situated into the story and find an easy connection to it. I liked the new elements this story brought and I liked how this book was a character lead story. Though there were multiple alternating POVs it ended up benefitting the story. The characters were also equally brilliant. They grew with the story and developed new ideas on the world. Each of them were easy to understand, and as a reader it was always clear who was speaking. The characters never failed to make the story entertains and I grew to love them all, save for few who got under my skin. Overall They Both Die at the End will send readers into a storm of emotions and never fail to entertain. I highly recommend this book to readers who have read Silveras past work, or to readers who simply enjoy an astounding contemporary read.